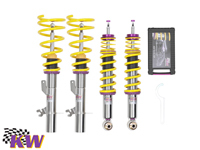 The Prime Suspension DSV (Dedicated Street Version) coilover is an excellent suspension solution for those who demand enhanced ride quality without sacrificing control. 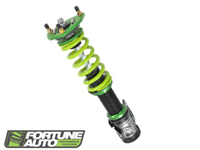 With over a decade of shock building experience, Prime Suspension has optimized the delicate balance between reliable longevity and performance. 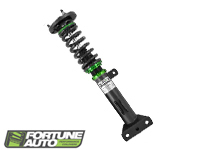 The Prime Suspension DDV coilover is designed to provide the most popular Drift applications with a damper that is versatile enough to adapt to all types of surfaces and track layouts. 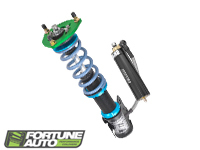 With countless track hours invested into the construction, Fortune Auto has damper that offers the grip needed in competitive drifting, while still maintaining optimal functionality at very low ride heights for that classic street style. 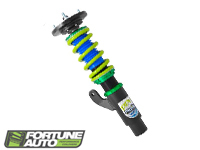 The Prime Suspension DDV coilover was built with one thing in mind: winning! The demand for adjustment at the track is very high and the DRV fulfills that demand with this 2-way configuration. Compression and rebound have 24-step adjustability independent of one another, resulting in a huge range of options with an opportunity to maximize grip and minimize lap times. 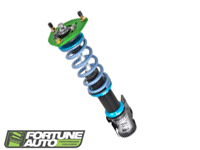 Research on the racetrack has helped Fortune Auto to develop the 500 Series into a great all-around shock absorber. Using high quality components that meet strict standards to optimize comfort, reliability, and longevity. The Generation 6 510 series dampers feature advanced suspension technology derived from their recent success in World Challenge, One Lap, & Global Time Attack. All systems are hand built in Richmond, Virginia. 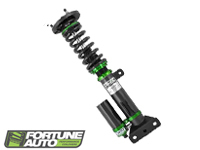 Fortune Auto insists on building bespoke suspension in order to offer the best quality control in the industry! Offering top tier race technology and durable race proven components, Dreadnought PRO damper systems are the ultimate in performance and adjustability. All systems are completely built in-house by our engineering staff in Richmond, Virginia. We insist on building bespoke suspension in order to offer some of the best quality control in the industry.